Glowing angels will warm your room and heart with this floor lamp. 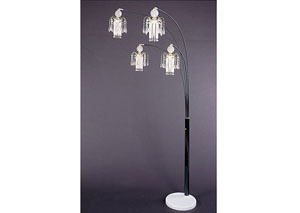 Featuring four lights, each shaped like an angel, this floor lamp is unique and special. A sturdy base in white supports the long, arching black stem which splits into four. Perfect for behind a sofa or chair as this floor lamp will arch over your furniture to provide light right where you need it.